Today I've been working again on the Faceless Oppressors, specifically the main weapons for the troopers. I currently have three designs and I need to decide which will be the standard weapon supplied with the troopers and which will be available as weapon upgrade sprues. Before I get on to the renders, I would like to preface them with a reminder that these are very large images of something that will be very small. Rifle barrels are at the minimum I feel suitable to ease of production (0.8mm) and details are exaggerated to be visible at actual size (around 16-18mm long) and after two moulding processes. The assault rifle design is very similar to that of the Resistance Fighters so check out how it looks on a figure- I think they're rather finer scaled than most sci-fi figures! Also, I make no apologies about the fact that my weapons have a very much 'Hollywood' feel rather than real-life tech. So just as designers for a movie (ideally a B-movie!) will take inspiration from real life weapons but twist them to suit their purposes and desired look, so have I. I won't be covering the guns in accessory rails but intend to keep a very clean aesthetic, as should be expected from looking at my previous work. 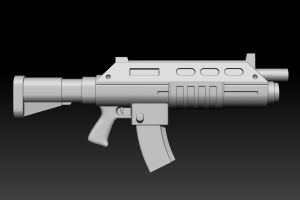 An assault rifle with integrated grenade launcher, this rifle sets the look of all three designs. In my imaginary world of Secrets, Spies and Saboteurs the various factions share a variety of designs through copying captured weapons. What differentiates each faction's weapons is the quality of manufacture. So while the Resistance manufactured weapons are fairly chunky and basic, the Oppressors weapons cleaner and sleeker. The SOE-designed experimental weapons also all share design elements, some of which have been stolen and copied by the Oppressors. What this means in reality is that the Oppressor weapons all share a curved underbody and a chamfered upper section, both in profile and cross-section. I also used an oblong vent shape, which references Soviet WW2 SMGs, in place of the round vents used on Resistance weapons. At its root, the design of the combi-rifle comes from the fact that I cannot fit an ordinary under-slung grenade launcher onto an assault rifle, due to the weapons all having to be interchangeable with the same hand positions. 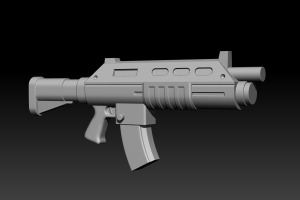 I decided on a single trigger mechanism, assuming some techy way of switching between firing the rifle and firing the grenade launcher... This keeps the design from getting cluttered in my opinion. The laser-rifle follows the basic format and silhouette of the combi-rifle, though this time the whole body has a curved cross-section shape. This refers back to the Resistance Fighter laser-rifle, which also shares the muzzle shape and vent locations, though here they are in the Oppressor oblong shape. I think I may add some detail inside the three forward vents, possibly some kind of cooling coil. The 'ammunition' comes in the form of a battery pack slotted into the extended lower section. This rifle closely mirrors the design of the Resistance Fighter assault rifle, but with the Oppressor body shape and vents. 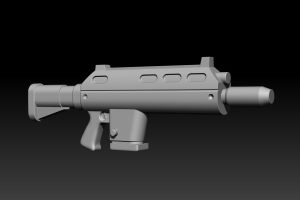 I feel I should reduce the height of the stock on this weapon; the height is needed on the previous two guns to balance them visually, though here it overpowers the longer barrel of the assault rifle. This change won't affect interchangeability as the stocks will be attached to the weapons rather than the figures. So those are the three main weapon designs for the Faceless Oppressors. What I need to decide on now is which to use as the standard weapon supplied with the Trooper pack. 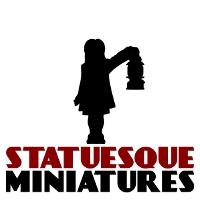 Let me know what you think in the comments below and I'll also add a poll on the Statuesque Miniatures Facebook page to see which would be most popular. 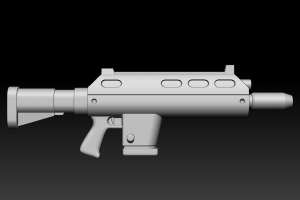 I also need to decide whether to add some kind of sights to the weapons. The Oppressors will wear full-face masks with integrated 'optics' (good ol' sci-fi B-movie style) so I don't want a full-on sight but I'm open to suggestions. All feedback welcome and hopefully I'll have some pictures of the Helmet design to show you soon! All three guns are quite good, but the one with the grenade launcher does not quite "read" like it has one. 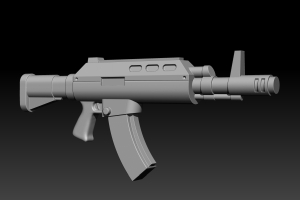 Maybe a magazine for the grenade launcher portion? Could be a side mounted one. As for the basic weapon for troopers, a near future look would give the underslung grenade launcher to all troopers, where a more contemperary look would be just assault rifles, and fancier guns to specialists. The idea is that the grenade is loaded in a slot under the hand grip. A magazine is going to get crowded I think, what with the oversized nature of all the parts. 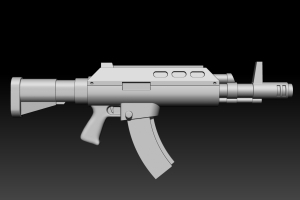 To be honest, I would be unlikely to make the ARs the standard weapons, but have them as an upgrade sprue for those who want a more contemporary look as you say, or something more overtly Russian influenced. Thanks Igor. I'd never realised until now that the wee bit under the barrel on the Haqqislam rifle was a grenade launcher! Hi Stephen, good to see you here. A handle could be useful to add a bit of bulk to the body of the AR to counter the oversized barrel. I agree about the Laser-rifle, I think it needs some kind of left hand grip. I'm used to looking at it with the hands in place and without them it looks a bit under-detailed. All three are really good designs and IMO don;t need to be changed at all. I think that the AR is probably the weakest of the three, but is a good option for those who might want to do Weird War stuff or alternate settings. I like it on an upgrade sprue and would persoanlly probabaly modify with a different mag to make it a special heavy hitting weapon. For standard issue, my favorite would probably be the combi, but having the many GL's seems a bit over the top. ilight of that I would prbably make the laser-gun standard issue - gives them a slightly more advanced feel then the resistance. Thanks GI. Good point about the laser rifle giving clear distinction from the Resistance. humm, if the narrow barrel is the 'rifle' then it looks odd to have it unaligned with where the breech would normally be. that might be what is making it look odd to people. The position of the rifle barrel on the CR is certainly a compromise. Ideally I would have it lower with the grenade launcher below the centre line of the gun, much like an Aliens Pulse Rifle. However, I can't do this because of the need to have the hands in a certain position. I like the proportions of the CR as it is now, but agree the rifle position could be confusing. I know this is a bit off-topic for this post, But would you be willing to do a post regarding your vision of your little world comparing and contrasting the 3 factions. I am still trying to figure out how they all fit together. I get the resitance is probably fighting the oppressors, but how does the SOE fit into it all. Will do, though it'll take a wee while as it's all a bit vague at the moment. In the meantime, there are little snippets of info in the category and product pages of the online store.